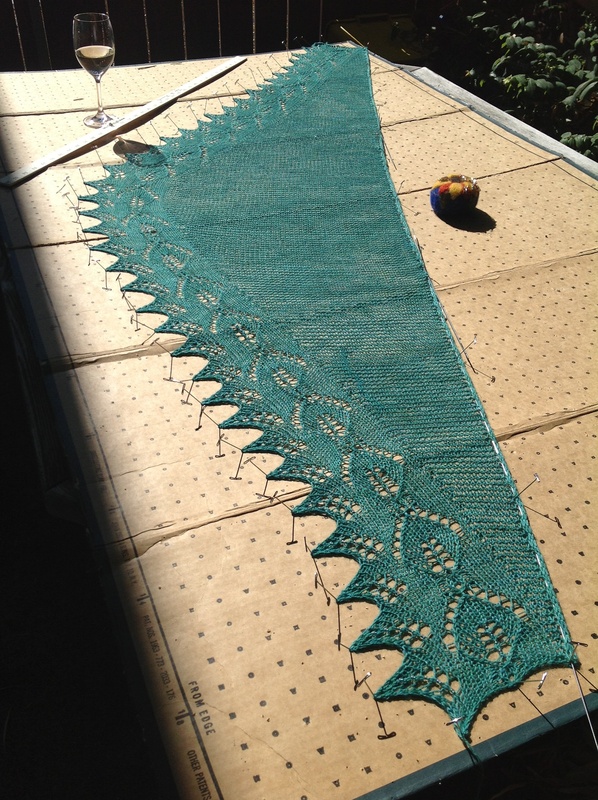 Blocking is magic for lace knitting. 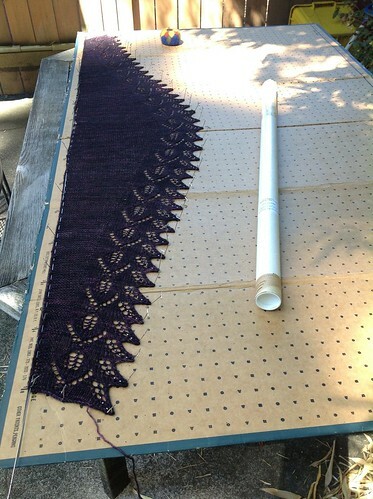 You may think that your project is finished once it’s off the needles, but that’s when the fun really begins. 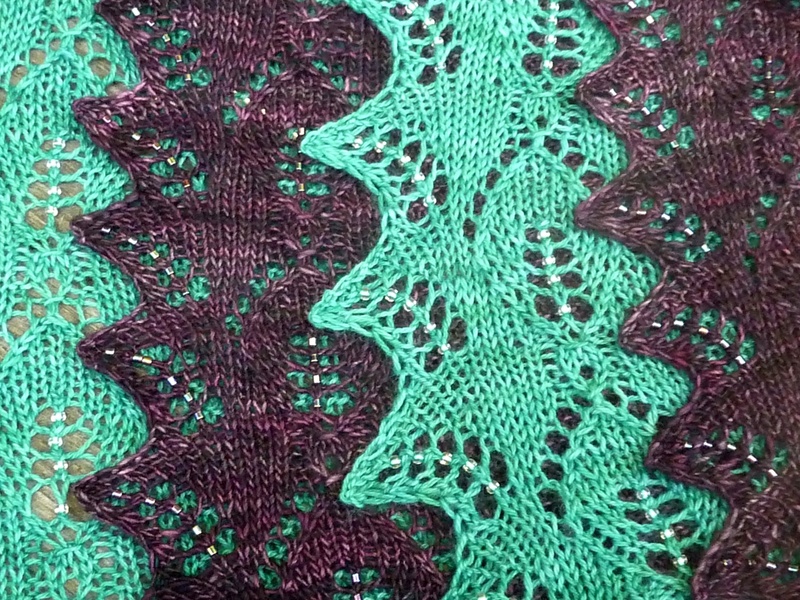 The true beauty of lace doesn’t show until you go through the finishing step of blocking. I thought I’d walk you through blocking on blocking wires, if you haven’t done it before. 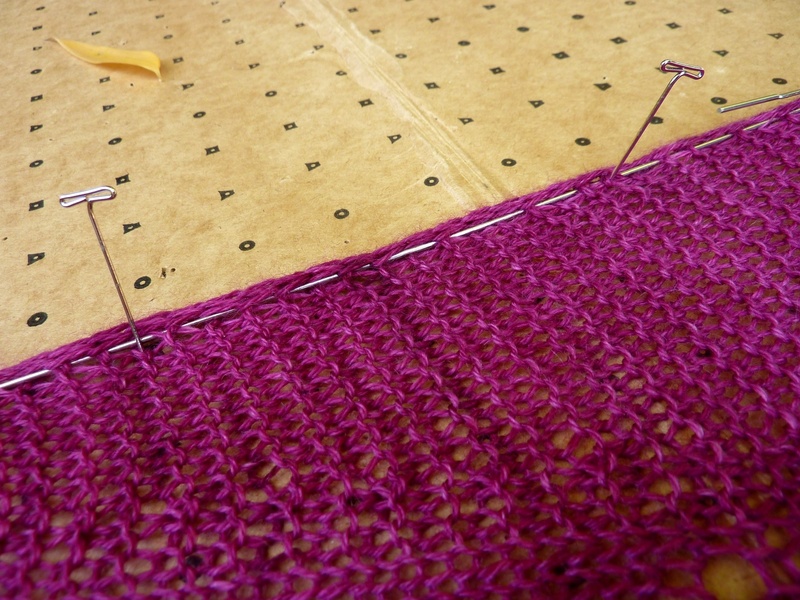 If you don’t have blocking wires, it’s also possible to do this using string in place of the wires (I’d use mercerized cotton, or linen), but I prefer the stiffness of the wires. Don’t weave in your yarn ends until after blocking. There’s going to be a lot of stretching going on. 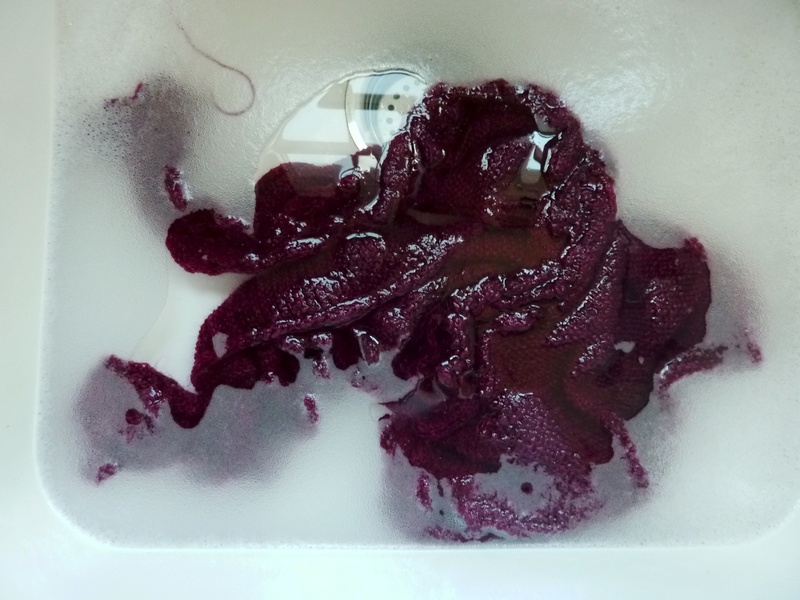 First, I soak the knitted garment in the kitchen sink with a little bit of Soak, my favorite non-rinse wool wash. Use warm water and allow the garment to soak for at least 20 minutes to relax the fibers. The garment is really saturated and stretchy at this point! Support it from underneath, and squeeze out as much water as you can with your hands. Do not twist or wring. Next, lay it on a folded towel, fold the towel over that, and walk all over it. Really. This will get most of the water out. 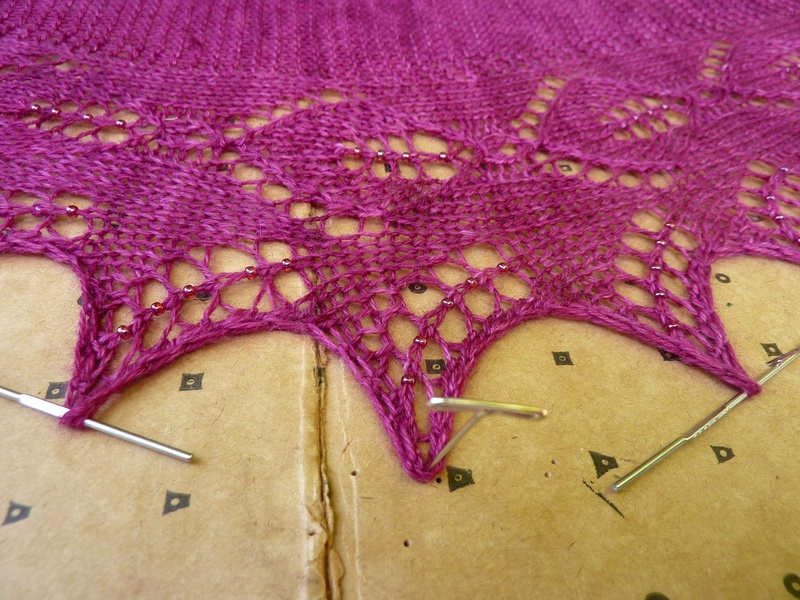 The next step is to thread the straight edges onto the blocking wires. I put the wires along the top edge, going over and under the garter ridges. If you have an especially long edge, you would use two or three wires to cover the length, but overlap the wires by an inch or so at the place(s) where they meet. I know that you may consider this top edge to be a curve, but it works fine to block it straight, and it’s much easier to pin out this way. 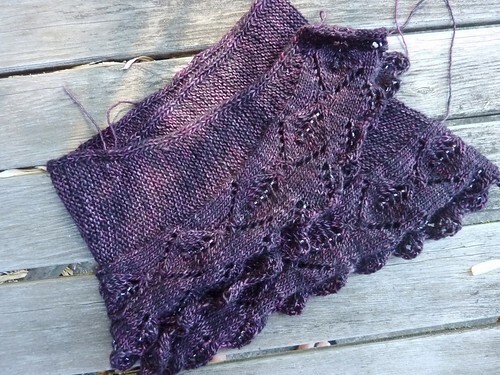 Triangle shawls are straight along the top; heart shaped shawls can be blocked straight along the top, too. 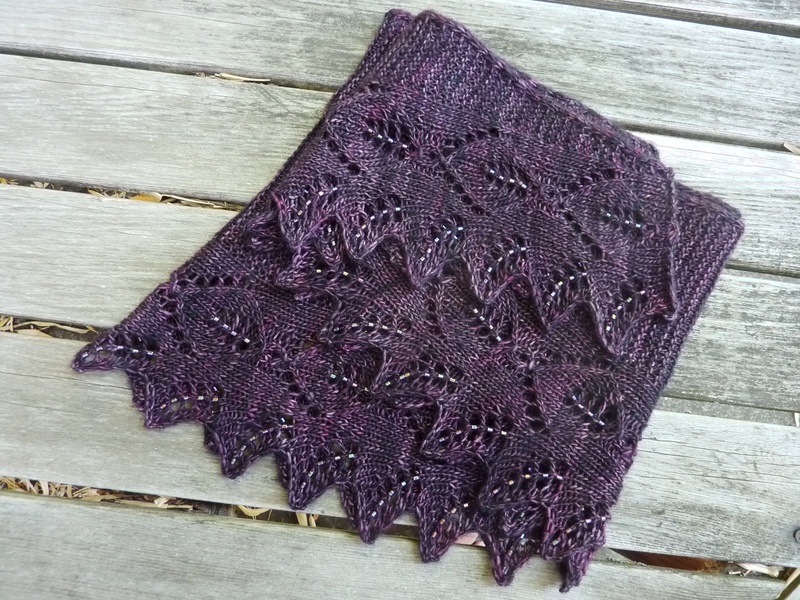 Crescent shawls like my Webfoot or Filigree? I like to pin them all around, no wires. Now the fun begins. Stretch out the garment so that the lovely laciness shines! Use the metal t-pins that came with the blocking wires to hold the wires in place. You’ll need to be working on a surface that can take your pins. In the summer, I’ve been using my old Dritz cardboard cutting board on a table outside. The cardboard is getting tatty after being pinned a bazillion times, but it still works. In the winter, I block on a futon sofabed in the basement. There are also blocking mats that you can purchase specifically for this purpose, and I’ve seen knitters use foam interlocking alphabet blocks, too. (A useful child’s toy, but be careful, some of the colors may transfer to your yarn.) Knitter’s choice! or you can pin each point out separately, like this center point. I pinned out each point of my peacock green Garland, but only because I forgot that I could run wires instead! Wires are much faster to set up. Let the garment dry completely, and then un-pin. Sew in your ends. The result? 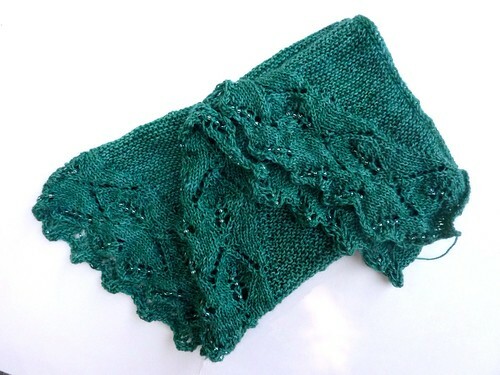 Instead of a crumpled wad of knitting, you have a diaphanous piece of gossamer loveliness. 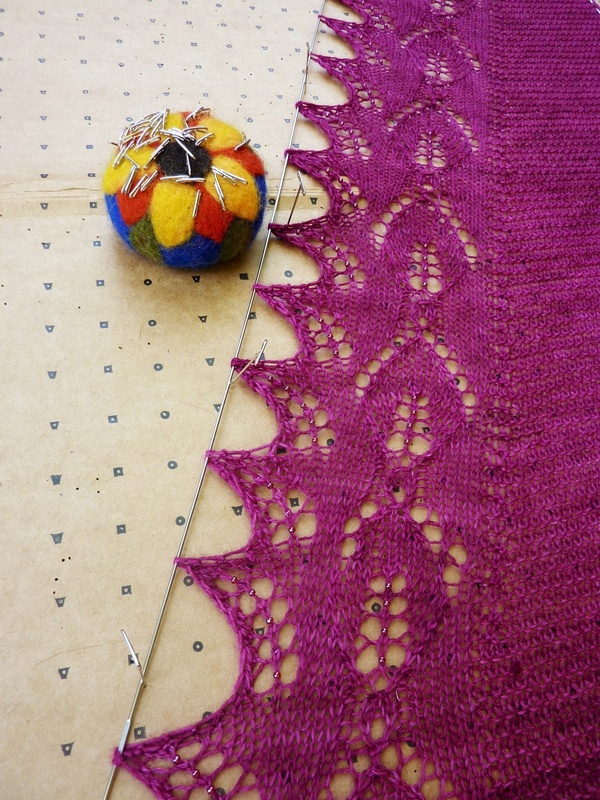 Do you block your lace? Aggressively? I hope so! 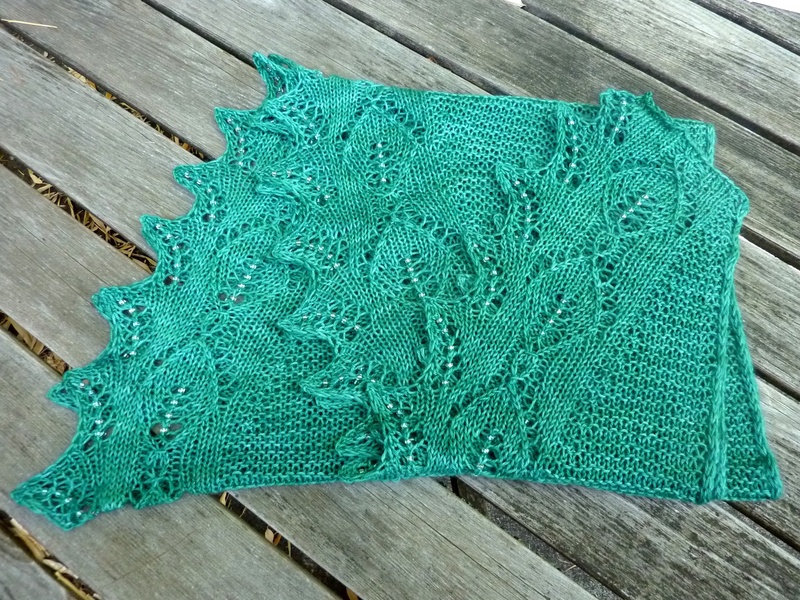 This entry was posted in KAL, Knit, tutorial and tagged blocking, blocking tutorial, Garland KAL, Garland shawl, lace, tutorial. Bookmark the permalink. You are so welcome! I think you will love your results. It’s really fun to see the change in the fabric when you pin it out. Have fun shopping! Thanks for sharing this awesome tutorial. I’ve been wanting to get blocking wires for a while now, so this will definitely come in handy in the future! Blocking wires are not required, but they definitely make the process a lot easier! Especially if you are blocking aggressively to really open up your lace. Enjoy! Thank you for the tutorial! 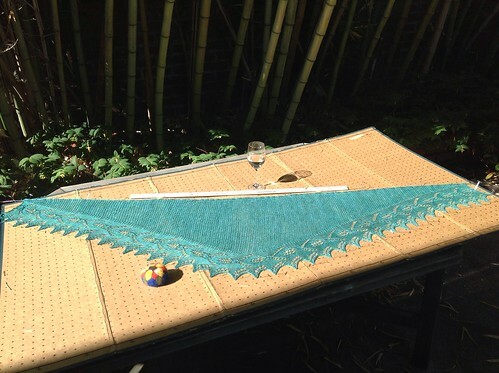 I’ve been blocking my lace pretty much this way for the three or four years I’ve been knitting lace, and it is an amazing transformation! My question is, do I have to do it all over again every time I wash my knitting? Thanks for your help! Yes, you need to re-block each time you wash your knitting. Sometimes I even wash not because the piece needs it, but because I want to re-block for definition!